Ever since my TCKs were cuddled into the front pouch and brought to the market or store, they have witnessed how money can give them “stuff”. They understood all too quickly how this system of money or plastic card works. I’m sure your kids are the same. They don’t just watch us. Toy manufacturers have caught on to this years ago. They sell fake money and plastic cards for pretend shopping. I’m not bashing toy companies, I actually think it is a brilliant way to teach kids about how money works IF taught intentionally. As kids grow and mature, we need to teach them how to manage their money. We do give our kids an allowance…sort of. They get paid for certain small jobs around the house like taking out the trash. They get paid for the work they do. If they don’t take out the trash, they don’t get paid. Then there are jobs that they have to do just because they are part of the family, like setting and clearing the table. Those they don’t get paid for. Our youngest got bright eyes and a huge smile when she got her first paycheck. She was ready to go to 7-11 and buy some gum. It reminded me the first time our oldest got his first paycheck and we made the decision to teach our children about money management. It was time to teach Mei Mei. We use Dave Ramsey‘s ideas because we like them. I’m sure there are other ways to teach your children, but here is what we do. 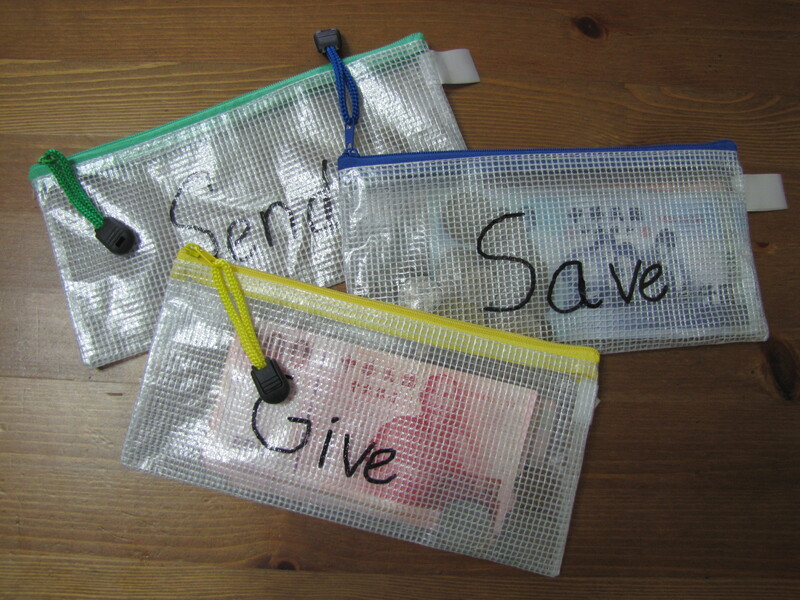 Each child has three envelopes. Spending: this is for the small fun stuff like gum, drinks, or stickers. Giving: Because we are a Christian family, we’ve taught our children that they have to give at least 10% to God. This envelope can also be for charity giving, which we’ve told our kids that they can put in more and use it towards that as well. Our rules are simple. We give them the money and a calculator. We teach them how to figure out how much is 10%. They put that in their Giving envelope. Then they decide how much they want to put into the Savings and the Spending envelopes. We let them choose. *We do this system all with the monetary bills of whatever country we are living in. If they get money from family in other countries, then we get out a calculator and figure the conversion rate with them, and then we exchange it for them. After that, they figure out what amount goes in each envelope. **When we travel to other countries, we do allow them to take their Spending envelope (if it’s worth the amount). They can exchange it at the airport for fun. ***We also do this system with Jie Jie, our daughter with special needs. She doesn’t have a “job” yet, so she doesn’t get paid, but she gets money for lost teeth and birthdays. I do believe that we will soon be giving her a “job” that is suitable to her needs in the near future. This all depends on maturity levels though. Like I said, there are other ways to teach kids about money and how to manage it. How have you taught your kids? Please comment below. If you’d like to read more from raisingmytcks, you can subscribe and new posts will come to your email directly.